Who Can Own a Full-Auto Machine Gun? Contrary to popular belief, it is perfectly legal for a law-abiding American citizen to own/possess a machine gun (sometimes called a full-auto firearm or automatic weapon). Of course, there are some restrictions on machine gun ownership/possession for non-government/law enforcement personnel. their relevant state law does not ban that the firearm (whether banning machine guns outright or any firearm with certain features). As you can see, machine gun possession is regulated based on the person (possessor), the firearm itself (when it was made), and where the firearm is possessed (which state). 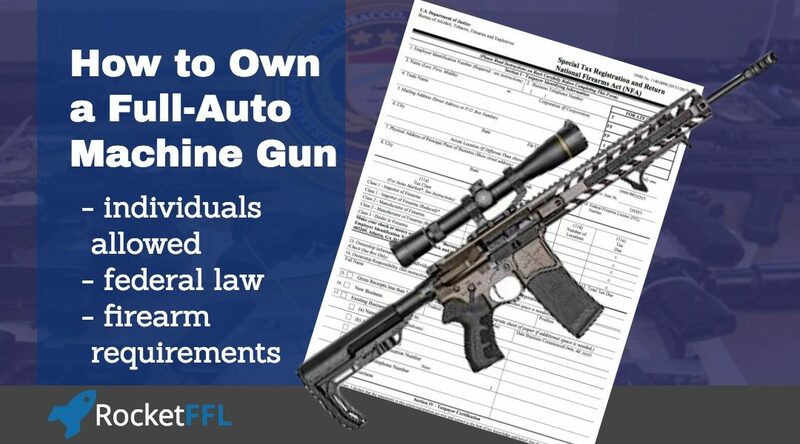 For example, someone can lawfully possess a machine gun made this morning if it is in connection with their duties as a government or law enforcement official, or if they have their Federal Firearms License (FFL) and have either made or possess the machine gun for possible sale to government/law enforcement personnel. To make or sell machine guns (and other NFA firearms like silencers) the FFL must also be an SOT. This is sometimes incorrectly referred to as having a class 3 license. Full-auto machine guns fit into a certain class of firearms called National Firearms Act of 1934 (NFA) firearms. These NFA firearms have extra regulations and controls. For example, unlike with “standard” firearms, NFA firearms (such as machine guns, silencers, etc.) are registered with the federal government and tracked from lawful owner to lawful owner – permission must be obtained prior to the transfer of these types of firearms and the ATF keeps a log of all currently registered NFA firearms. Well, to be more accurate, a “prohibit person” can’t lawfully possess a machine gun – ownership is irrelevant. A “prohibit person” is a class of person defined under federal law who is not allowed to posses firearms nor ammunition (not just full-autop machine guns). In 1934, the National Firearms Act (NFA) was passed which restricted machine gun possession, among other types of firearms. These “special” firearms received extra regulations because of the gang violence of the time. The Bureau of Alcohol, Tobacco, Firearms, and Explosive (ATF), then a part of the Dept. of Treasury, was able to regulate this special class of firearms by requiring registration and taxation prior to lawful possession. At the time, a $200 federal tax was paid and an application was made for approval by the federal government. Once approved, the paperwork was returned with a $200 stamp showing that the tax was paid and the listed person/entity was the lawful possessor of the particular NFA firearm. Under federal law, a machine gun is a firearm that fires more than one bullet for every pull of the trigger. One trigger pull + one bullet = standard firearm. One trigger pull + more than one bullet = full-auto / machine gun. It is important to note that the speed at which a firearm can shoot is not relevant to the definition. This is why a device, like a slide-fire stock, can be used to mimic full-auto fire without actually making a machine gun. This device allows the firearm to move rearward inside the stock under recoil (it “slides” upon “firing”) and it allows the shooter to keep their trigger-finger stationary. If the shooter then applied forward pressure on the firearm, then the firearm is allowed to slide forward after it recoils thereby pulling the trigger into the shooter’s stationary trigger-finger. This might look and sound like a machine gun, but it is still only one bullet per trigger pull. Devices like these also create sporadic sounding full-auto fire – they typically are not as consistent in their rate of fire as a machine gun is. Also, semi-automatic is NOT the same as fully-automatic! Full-auto machine guns are very rare and almost never used in crimes. In fact most NFA firearms are only related to possession based crimes (person shouldn’t have possessed it wherever they were) and are rarely used in the commission of a crime. This is because NFA firearms are so expensive and the background check process is so thorough. Therefore an AR-15-style firearm is most likely NOT a machine gun. It COULD be one, but 99.9% of civilian owned AR-15-style rifles are semi-automatic only. In 1986 federal legislation, called the Firearm Owners Protection Act (FOPA), prohibited the possession of “new” machine guns by citizens. This meant that only machine guns made prior to this date in 1986 were lawful to be possessed by citizens (this is still true). Of course, this prohibition did not apply to FFLs (certain gun dealers / manufacturers) nor law enforcement. This ban on machine guns created a significant supply/demand price increase. Although it is perfectly legal for a law-abiding citizen to own a full-auto machine gun, it must be one made before 1986. This means that an AR-15-style machine gun made before 1986 likely carried a price tag of less than $1,000 when it was brand new. Now that it is over 30 years old, however, it can easily fetch a price of $14,000. Compare that to a brand new machine gun which can still be found for around $1,000. Remember, though, if you want to possess these modern machine guns, you must be a government employee possessing the machine gun in connection with your official duties OR you must get your Federal Firearms License (FFL) and become an SOT. As an FFL, you must also pay a special yearly tax to become a Special Occupational Taxpayer (SOT) – this allows you to purchase and sell NFA firearms (including machine guns) without paying a tax per item/transaction. Certain states can outright ban machine guns regardless of federal law. The machine guns can be banned outright based on function (because they are machine guns) or they can be banned/partially-banned based on features. For example, some states ban “assault weapons” based on certain features – although these bans primarily restrict semi-auto firearms, most full-auto machine guns also have these banned features. If you lawfully possess a machine gun in your home state, be VERY careful when you travel to ensure that you aren’t violating the state and/or local laws of wherever you’re traveling. Become an FFL/SOT (cheap and fast). Find a currently registered machine gun made before 1986 either at a gun shop or a private individual. You can search locally or online (but out-of-state online sales of all firearms must go to your local gunshop). Purchase the machine gun as an individual or through a trust – but, no, you can’t take it home yet! Trusts were popular to avoid certain requirements (fingerprints, law enforcement approval, etc.) but ATF changed the rules last year. Previously, your local Chief Law Enforcement Officer (CLEO) approval was required but the ATF changed the rules last year to only require notification. Also, members of a trust could obtain new NFA firearms without fingerprints/photos but now every lawful possessor is required to submit them each time. These rule changes removed much of the reason to get a trust. Fill out an ATF Form 4 application to transfer an NFA firearm. This application will include a $200 check for your tax, your fingerprints, a passport-style photograph, and information about you and the firearm. Wait 9-12 months for the ATF to approve and return your paperwork. Take your machine-gun home and enjoy! Get your FFL and become an SOT. Either make your machine gun or purchase a machine gun (depends on the type of FFL you get). Getting an FFL an becoming an SOT is a LOT easier than most people think. For example, getting a manufacturer’s FFL out of a home is possible! Despite what many folks think/say, a home-based FFL is not only possible, it is the most common type of FFL currently! It is true that many folks have tried this and failed – they either live where it is strictly prohibited (e.g. apartment in New York City) or they tried to do it on their own without help (ahem…like using us). If you become a dealer FFL, you can purchase NFA firearms on a Form 3 tax-free (because you already paid your SOT tax). Therefore, for $200 for the first 3 years (and $90 for each 3 years after) you can be an FFL gun dealer – even from your home! You can save money on guns and make money with guns (even sell them online). If you also become an SOT ($500 a year), you can also deal with NFA firearms. And, if you have a manufacturer’s FFL, being an SOT will allow you to make as many machine guns as you like without permission from the government/ATF. You can get a manufacturer’s FFL for $150 for 3 years and you can be an SOT for $500 a year – clearly much cheaper than buying a pre-1986 machine gun. However, if you make them, there are other FFL fees. If you are just a dealer, however, those extra “making” fees don’t apply but you have to get permission prior to possession – at least you can still have brand new machine guns. If you’re considering being an FFL, I hope that you check out our first step to making money with guns. Call me ignorant, but I don’t understand how an AR platform RIFLE is considered a machine gun. I think of the M249, the 240B, the M2 as machine guns. A standard AR-15 rifle is not a machine gun. However, if it is a full-auto rifle, then it’s a machine gun. Glock 18, a machine pistol (machine gun). When it can fire more than just one round per trigger pull. That designation is not based on the wrapper of the weapon. So then say in 10 years, you don’t renew your FFL…are you now in violation of the law, and will they seize your property? In your podcast about machine guns, you stated that with a type 7 FFL and becoming a SOT, a person could keep the NFA items they posses when they give up their FFL. What happens to that pile of lower receivers you’ve made into machine guns by drilling the 3rd hole once you give up your FFL? NFA firearms, other than post-86 machine guns can be maintained. Those machine guns must be transferred to an authorized source – this includes other FFL/SOT and an LE letter isn’t required by them in this specific instance. Hey Ryan, so are you saying if I make a machine and I no longer want to be FFL? I can’t keep my automatic weapon that I made for my own use? I differ with your definition of what constitutes a machine gun. An automatic rifle capable of firing full auto is not a machine gun if it is magazine fed. A machine gun is belt fed. So, an M-60 firing one bullet at a time is not a machine gun even if it is belt fed. Now that they are going to make Bump Stocks illegal to possess….can we pay the tax to the ATF in order to keep it, if they are classifying it a machine gun?